The pacifier clip’s spring mechanism can break and release small parts, posing a choking hazard. These items were sold exclusively at Babies ‘R’Us and Toys ‘R’Us. The U.S. Consumer Products Safety Commission issued a recall alert on September 8, 2016. 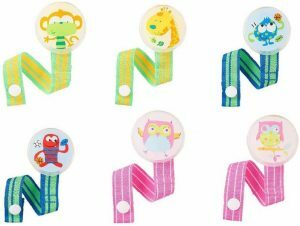 This recall involves Babies‘R’Us pacifier clips sold in an assortment of six colors and character designs, including a red monster, blue monster, monkey, giraffe, owl with one eye closed, and an owl with both eyes open. The pacifier clips have a circular plastic cover affixed to a metal spring clip and a fabric strip with snaps at the other end. The recalled pacifier clip assortment has model number 5F6237F and “®2014 Geoffrey, LLC” engraved on the back to the plastic cover. REFUND – Consumers should immediately take the recalled pacifier clips from babies and return the product to Babies ‘R’ Us or Toys ‘R’Us for a refund. Babies‘R’Us and Toy’R’Us stores nationwide from February 2015 through April 2016 for about $4. Toys ‘R’ Us at 800-869-7787 from 9 a.m. to 5 p.m. ET Monday through Friday, or online at www.toysrus.com and click on Product Recalls for more information.